*Available at all bars and restaurants during opening hours, except when ordered as room service where normal charges apply. Once a staging post on the old sailing route to South Africa, Mindelo, on Sao Vicente, is the largest port, with attractive old Portuguese colonial buildings that betray the island's intriguing pedigree. Salvador is located on the northeast coast of Brazil on the Atlantic Ocean and is the third largest city in Brazilian. 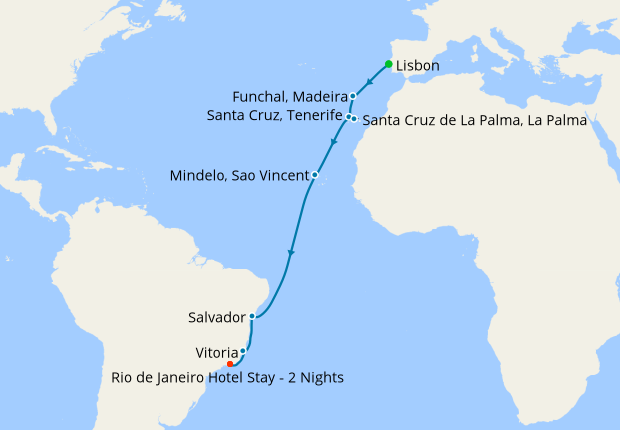 Salvador, Brazil has a tropical climate including rainforests and lush vegetation. Local residents enjoy sharing their exotic dancing and music skills with tourists. Residents are also considered some of the friendliest and most outgoing people in Brazil. Tourists are welcomed with open and friendly arms by the majority of local residents. Rio is the second largest city in Brazil and the state capital of Rio de Janeiro. The city is best known for its beaches, carnivals, football, music and its well preserved tropical forests. This was our second cruise with Azamara, but first time on Pursuit. The ship was pristine, we really liked the new addition of the Den that replaces the casino. We loved the living room, particularly the Trio 3 Aces that played most evenings before dinner. 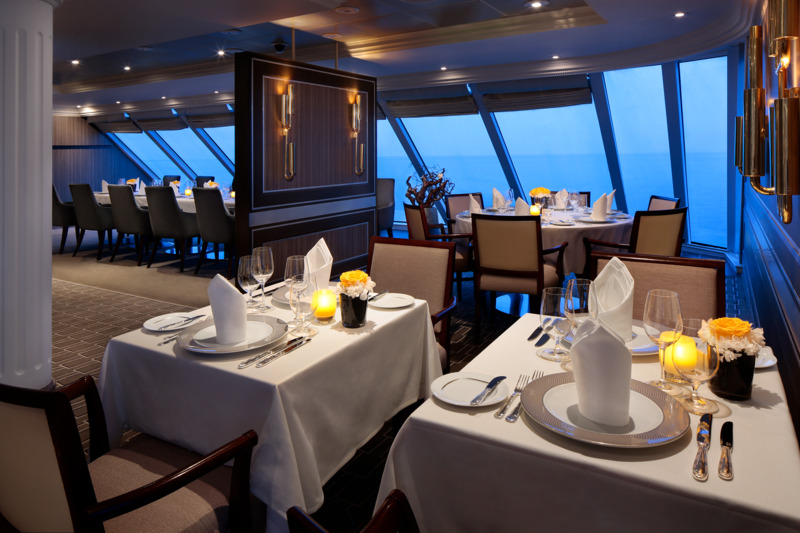 The food and drink were excellent and our stateroom was very comfortable and clean. 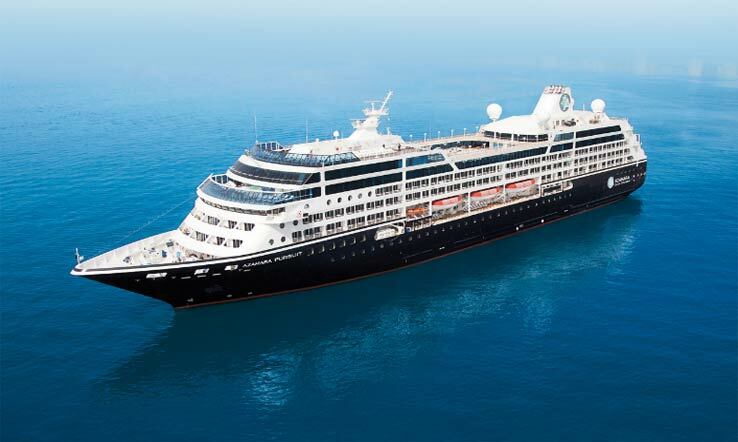 We will definitely choose Azamara again for our next cruise. On 26/10/18 we embarked on a 13 day holiday booked through Iglu for the first time. We spent two days at the Oxford Hotel in Rome (3 star) a little tired, but staff were excellent. We had 9 nights on the Azamara Pursuit, Rome to Barcelona where we spent 2 nights at the Gruphotel 678 (Room 114) which was excellent. We had an eventful cruise (our 15th cruise) which was marred by some horrendous weather conditions. We were unable to make ports of call to Sardinia and Corsica, as well Monaco. Throughout our journey the ships crew and serving staff were brilliant and we could not thank all on board enough as they gave 100% to make sure our vacation was a superb one and they succeeded. We have sailed the Quest and the Journey and we felt that the Pursuit, although a lovely ship was not quite the finished article. A big thanks to Iglu for the flight and transfer arrangements. Everything went like "clockwork". One whinge; we had to leave the ship in Barcelona by 9am and our taxi was booked for 10.30am, which did arrive a little early. This is the first time we have used Iglu in booking and cruise and it will not be our last. Many thanks. James C.